I really wanted to use the little ticket punch so I cased this card right from the SU demo site. This card uses the 'You're Amazing' stamp set on page 33. There are some amazing images in this set and several coordinate with framelits, too. Here are all the new 2012-2013 colors together in a flower. I even ran some of the layers thru new embossing folders. I think they look pretty. Isn't this a beautiful thank you card. This card was designed by Dale at a recent Stamp-a-Stack. The sunflower is stamped on the white cardstock and then cut into equal parts. I also love the dimension you get when the panels are raised. This background stamp now comes in clear mount. Love that! Floral District is one of my favorite DSP in the catalog. I love all the colors, very summery to me. I made this card at a Stamp-a-Stack last month, the design is from Laura. Check out that cool flower on the front. 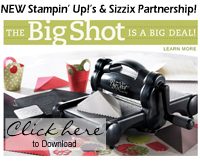 To create it, punch flowers from DSP and coordinating cardstock using the Blossom punch. Curl the edges using a pencil and layer together with a brad. Impressive and simple. I love the Blooming with Kindness stampset on page 87. That flower just calls to me. Here I paired it with Midnight Muse and Summer Starfruit, Comfort Cafe DSP, and the Fancy Fan EF. Do you see the paper piercing around the die cut? That is done using the Essential Paper-piercing pack on page 181. What fun! This is an old technique that is new again. Not quite sure why, but most gals I know how a shoe problem. That is...we can not stop BUYING them. I am no exception, I have quite a few shoeboxes in my closet. When I saw this stamp set in the catty, I knew I had to have it. 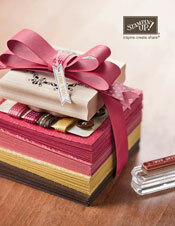 Check out this stampset on pg 39 called Fabulous You. Ever since I saw it, the first thing I wanted to do was emboss it. We have so many pretty embossing powder colors now, I used Melon Mambo. The Floral District DSP just shouted at me, so here is what I came up with. I colored in some of the detail with markers and added rhinestones, of course. I hope my girlfriend enjoys her birthday card.